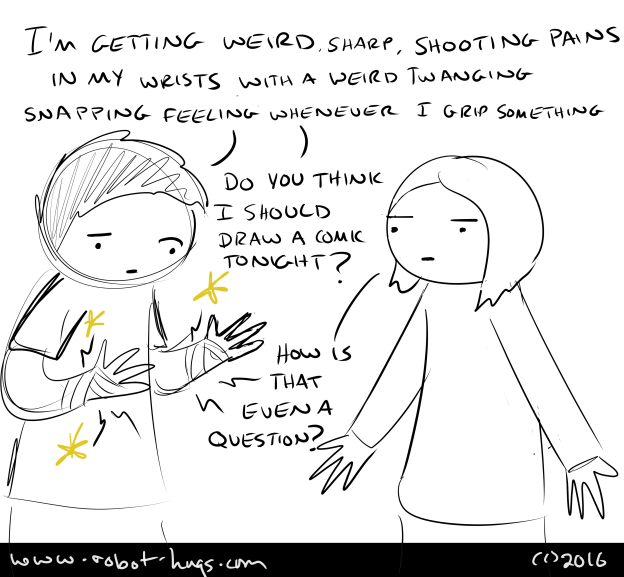 i'm having sharp, shooting pains in my wrist, with a weird twanging snap whenever i try to grip something. do you think i should draw a comic tonight? I’ve been spending most of this week either doing wireframes and diagrams at work or drawing comics at me and today my wrists say no, and i spent the entire day looking pretty dumb at work with my wrists wrapped in bandages so i’d better take it easy. Last year at the exhibitors’ programming at TCAF I went to a workshop called Pain is Your Frenemy by Kriota Willberg, the entire thesis of which was essentially if it hurts, you probably shouldn’t do it as much, which turns out to be pretty good advice all around.